This article refers to specialized NPCs. For the side mission, see Paramedic. 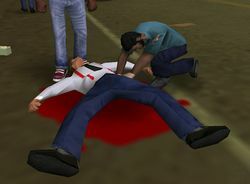 A paramedic reviving a dead pedestrian in GTA Vice City. Two paramedics in GTA V.
Paramedics are mobile emergency personnel tasked in providing on-site treatment of injuries, as well as transport to the hospital. In the Grand Theft Auto series, paramedics, like the police and fire department, are a form of pedestrian that tend to respond to multiple pedestrian killings, providing every game in the series with a certain degree of realism as well as comedic effect. 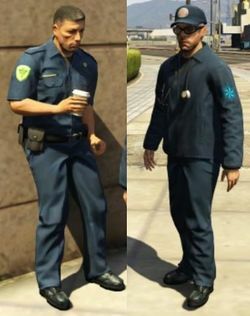 In-game, paramedics usually appear after three or more pedestrians, either civilians or those of civil services, are killed by either the player or other NPCs. They arrive in groups of two in Ambulances (or the Medicar in Grand Theft Auto 2), and will attempt to revive the killed, with varying success; if the pedestrian is not mutilated by explosions or severe gunshot wounds, paramedics can revive the pedestrian. Once all victims are attended to, the paramedics will depart. In Grand Theft Auto IV, paramedics may appear in both single player, as well as multiplayer. In some Grand Theft Auto titles, Paramedic dialogue is quite humorous. This is shown when paramedics revive NPCs and say things such as "Check his wallet" or "No insurance? Have an aspirin". With the exception of Grand Theft Auto IV, such revivals will completely heal a pedestrian to full health (pedestrians that previously wield a weapon will not regain it after revival). In GTA IV, only pedestrians that are still alive but severely injured (slumped on the floor but still moving, or limping) can be treated with limited success as paramedics are unable to revive dead pedestrians. In single player in GTA IV, it is possible to call for a paramedic using the player's mobile phone by dialing 911, and selecting "2" after to request for two paramedics in an Ambulance to arrive and treat wounds of the player or non-player characters at a cost. If no one is available for treatment upon their arrival, the paramedics will simply believe they received a prank call and leave. In GTA V, due to the absence of the injury system in GTA IV, revival of a pedestrian is now at random. In addition, both paramedics leave the ambulance as opposed to one. Paramedics are commonly depicted as medical workers dressed in medical uniforms (basically a shirt, pants and rubber medical gloves, with the optional jacket) and portable medical equipment adapted for use outside hospitals, and are usually depicted dressed in blue, green or white. Upon arrival, most paramedics will utter dialog relevant to their job, primarily providing encouragement to the wounded; unusually, in Grand Theft Auto III, paramedics are also known to sing lines of songs from Flashback FM and Rise FM. In GTA III and GTA Liberty City Stories, the paramedic uniform closely resembles that of the real-life paramedics in London, rather than in New York City (though in GTA IV the uniforms were changed so that the uniforms resembled New York more). In GTA IV, the real-life Star of Life appears on Paramedics' uniforms rather than the altered version used on ambulances from GTA III to GTA Vice City Stories. The San Fierro paramedics in GTA San Andreas are implied to be bisexual, and abuse the power of their jobs. They may utter humorous phrases such as "Here, let me undo those pants!" or "Do you want mouth to mouth angel? ", as they will say such phrases whether they are treating male or female victims. In addition, they have very high-pitched stereotypical accents of a homosexual man. In GTA San Andreas, paramedics only respond to medical-related emergencies within the city limits of Los Santos, San Fierro, and Las Venturas. This page was last modified on 30 January 2017, at 07:03.